Last Sunday evening was stunning on the north Antrim coast. The day had started cold, dull and wet but by late afternoon the temperature was rising. I drove over to Ballycastle for the evening. There was a tall sailing ship out in the bay making its way into the harbour and it was clear enough to see the coast of Scotland beyond Fairhead. By this point in the afternoon yesterday my son was loosing patience and asking to go back to the car. This shot faces towards Ballintoy. I will admit the shell was well hidden in the grass around the flowers when I first noticed it! The beach at Whitepark bay. Enjoying a long weekend on the north Antrim coast with my 9 year old son. We took our cameras out yesterday afternoon and ended up walking down to Whitepark bay. 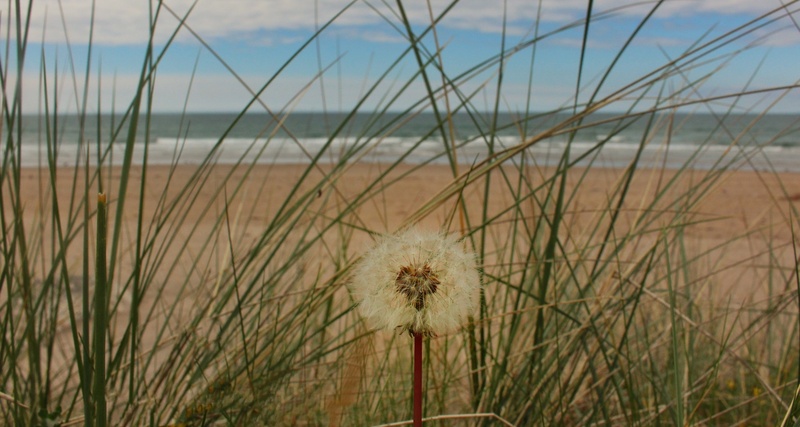 The beach is flanked by sand dunes and being late spring there are plenty of flowers scattered through the grass. Whitepark bay is on the Atlantic coast of Co. Antrim. It’s never crowded because, although it has its on car park, there is quite a long walk across sand dunes before you reach the beach. Not for the heavily laden family who bring a car load to the beach. It is common place to find a small herd of cattle wondering close to the water’s edge and sometimes you need to watch where you place your bare feet. Facing the beach just above sea level is Portbradden – a tiny hamlet with I believe the smallest church in Ireland and a couple of newly constructed properties for sale also. This is one of my favourite plants in the garden. We transplanted it from out previous house when it was much, much smaller. With little other opportunity today as it rained most of the time I ventured out with my camera to the back garden. Tried very hard to catch rain droplets hanging from the tips of the leaves. I often take a walk in the park before church with my camera. The views of Christ Church vary quite a lot during the year depending on the trees. Right now of course the trees have changed dramatically so for large parts of the park it is hidden. Taken yesterday in the back garden. This is probably the highlight for this plant. In previous years I have seen George our ginger cat decide that it makes a comfortable bed. Right now however it is growing fast and it’s flowers are beautiful!